How often have you wondered what a state trail actually looks like on the ground before you’ve visited? 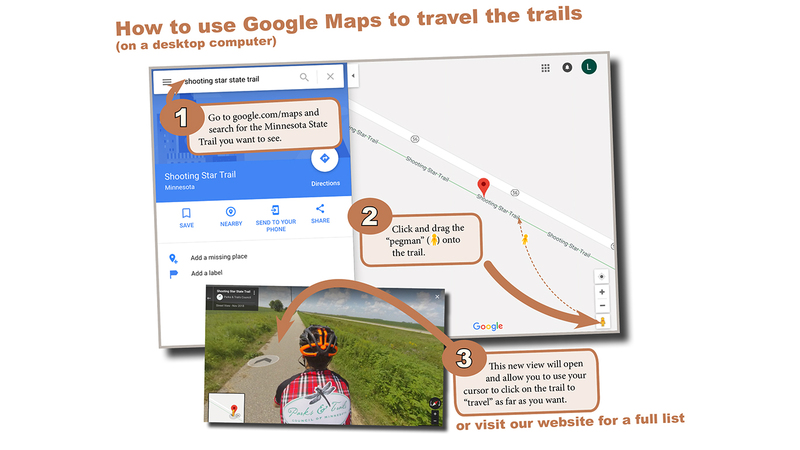 Well, you can put your imagination to rest, because Parks & Trails Council of Minnesota has partnered with Google Maps to allow anyone to “virtually” experience any Minnesota State Trail that is paved. This includes 22 trails covering nearly 600 miles. This mapping project is an off-shoot of our main research objective, which was to systematically evaluate the condition of Minnesota’s state trails. We plan to release that report in the spring. It will be a rigorous update to a similar report we issued in February 2017, which is available on our website. In the meantime, we took all the photos we captured while biking the trails this past autumn and uploaded them onto Google Maps. See the list of all the state trails and links that bring the user directly to the specified point on each trail. For people using mobile devices, the only way to navigate to the trails’ streetview is by clicking on the links on our webpage.